A cardiac surgeon follows the advice of his wife and a radiologist friend—and it probably saved his life. 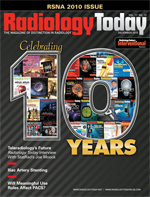 Check out this timeline highlighting Radiology Today’s first decade of covering imaging. Stenting iliac arteries benefits peripheral artery disease patients out to two years, according to a new study. Here’s a look at what is new and innovative in the field. Filmless doesn’t mean paperless, but facilities are seeking IT applications to help eliminate paper yet capture the information in a DICOM environment. Cell phone cameras are everywhere—including where they shouldn’t be. Their misuse in a healthcare setting can create trouble for both the user and the facility. Does your facility have good protections in place? Use our exhibit hall maps, exhibitor index, and program highlights to plan your visit and support the sponsors who bring you Radiology Today. Zevalin and Bexxar are FDA approved to treat follicular B-cell non-Hodgkin’s lymphoma. Learn about how they’re being used in a clinical setting. Study Finds Long-Term Survival Increase in Breast Cancer; Can PET Evaluate Treatment Response in Ovarian Cancer? 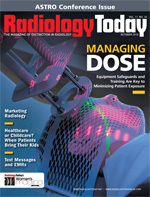 The industry is working to safeguard patients against radiation overexposure with improvements on radiation therapy and scanners and through better training. 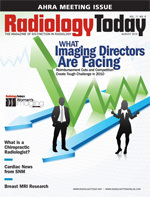 It may be time for your radiology practice to shift from managing to building a business. Women’s imaging centers aren’t in the childcare business, but many patients are beginning to expect such services when they show up for an exam. Here’s a look at equipment and services for your facility. Working together well benefits everyone, especially patients. Imaging veterans discuss ways they promote a positive work environment in their facilities. This new path in liver cancer treatment is becoming more widely traveled. Its growth is tied to its effectiveness and perhaps better communication among the interventional radiologists, oncologists, and nuclear medicine physicians involved. The Give a Scan project hopes to build an imaging database to help cancer researchers. There are about 150 chiropractic radiologists in this country and they consider themselves similar to neuromusculoskeletal radiologists, primarily serving practicing chiropractors. Scientists and clinicians are looking for the best ways to utilize MRI in diagnosing and monitoring breast cancer. Check out this selection of tools to help your facility. 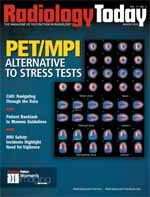 For a nuclear medicine imaging modality as sophisticated at PET and PET/CT, new products and enhancements to existing systems come from customer feedback on everything from functionality to image quality and the need for cost-effective imaging solutions. Several interventional radiologists discuss how collaboration with gynecologists has helped improve both their practices and patient care. SPECT/CT Image Earns SNM Image of the Year; Why Do Early-Stage Lung Cancer Patients Skip Surgery? Using near infrared spectroscopy delivered through a catheter may help doctors better identify arterial plaque that is more likely to cause heart attack or stroke. Magnet strengths are increasing, implants and devices enter the market regularly, and MRI professionals need ongoing guidance from expert sources in screening and scanning. While interventionalists see that the procedure helps their patients, two clinical studies report that vertebroplasty is no more effective than a sham procedure. What happens when research data and doctors’ clinical experiences collide? Is That Safe in an MRI? Improving Risk Prediction — Could the Ankle-Brachial Index Help Predict Heart Attacks? Mendelson focuses on the implementation of front-end voice recognition and radiologists editing their own reports at Mount Sinai Medical Center in New York City. Diffraction-enhanced imaging is years from commercial application, but it could provide clear images with as little as 1% of the radiation exposure of current equipment. When bringing on physician partners, most experts see little evidence of value beyond an appropriate share of a practice’s hard assets. However, there seems to be some consideration for goodwill in merger and acquisition activity. Equipment manufacturers share the latest on their systems. Interventional radiologists are evaluating how to use cryoprobes to freeze and kill tumor tissue. 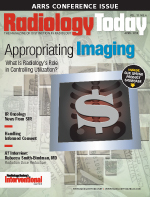 Appropriating Imaging — What Is Radiology’s Role in Controlling Utilization? Growth in imaging volume and cost has caught the attention of both public and private payers, producing efforts to contain expenditures. While test-ordering physicians outside of radiology drive much of this growth, imaging organizations bear the brunt of reimbursement cuts. What can—and should—radiology do to control imaging volume? Consistently reducing radiation dose in diagnostic imaging begins with measuring how much radiation a patient receives during an exam. Smith-Bindman and colleagues have researched this area, and she has some clear views on how radiology can reduce the radiation patients receive in the imaging suite. Interventional radiologists are pursuing less-invasive treatments for cancers, including some that oncology has not yet found effective ways to treat. This report from the Society of Interventional Radiology annual meeting highlights research efforts offering options (or future options) for previously inoperable tumors. 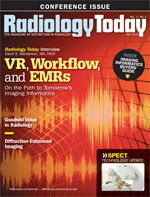 Take a look at what’s new for spring in imaging products and services. 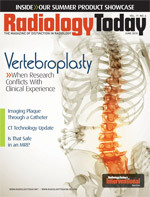 Radiology Today provides a look at what’s new in computer-assisted detection software applications that can help physicians better detect lesions. Although dangerous MRI incidents are rare, they happen often enough to remind everyone that there may well be risk that the imaging community hasn’t thought about yet. 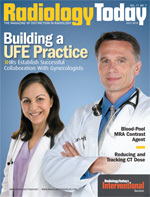 Breast imagers report that women visiting their practices have joined the attack on the USPSTF mammography guidelines. Cloud computing is a popular buzzword, but the idea has been around for years. One new imaging informatics application is using the cloud to share images and medical information. Two companies launched their Web-based information-sharing services at RSNA. 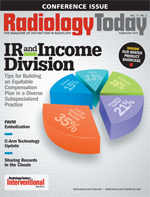 An IR service can provide an excellent revenue stream for a radiology group. But IR brings different costs and commitments that often need to be reflected in a group’s income division formula. IR researchers are showing that up to four dangerous arteriovenous malformations can be effectively treated in a single outpatient visit, greatly streamlining the treatment for patients compared with what is widely done today. Take a look at what’s new in C-arm systems. An introduction to products that can help you provide better care. Radiology Today selected these four topics from the RSNA annual meeting as trends to watch in the coming year and beyond. One is increased competition; check out the others in this annual feature. 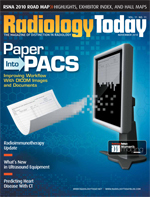 Radiologists agree that bringing in outside supporting information adds value to a radiology report. The challenge seems to be developing an efficient, cost-effective way of doing that. Experts discuss the problems and success of decision-support tools. 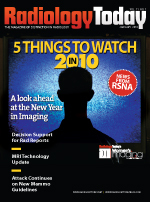 Here is a review of what’s new in MRI machines on the heels of RSNA 2009. New guidelines suggesting that women at normal risk for breast cancer should not routinely have mammograms until the age of 50 have brought a barrage of criticism from imagers, cancer organizations, advocacy groups, and patients themselves. They think it is foolish to strip away what they see as proven benefits of mammography. 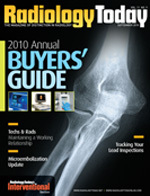 Take a quick look at new equipment and service offerings from RSNA 2009.